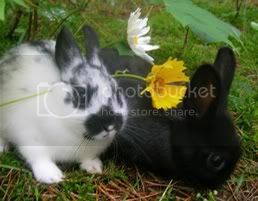 Note: This article is written for rabbit breeders who are considering selling Easter bunnies as pets. However, if you recently purchased a pet bunny or plan to purchase one, the other sections of this website are chock-full of practical advice for keeping happy, healthy rabbits. Why not start with the Rabbit Care section? Note 2: Rabbit breeders have all manner of opinions on this subject. This is just one breeder’s thoughts for your consideration. We don’t “do” Santa Claus in our house. I always felt that Santa distracted folks from the real meaning of Christmas. So we always treated Santa as a fun story, but not one that we lived out by pretending he was real. I never had the same feelings about the Easter Bunny, for some strange reason. Easter was so full of worship, rising early to go to church, wearing new clothes to symbolize the fresh new start that was given the very first Easter. And new birth, symbolized by butterflies and the birth of baby rabbits, seemed to be only reminders of the real reason we celebrate Easter, rather than distracters. And some people will be tempted to make a snap decision to buy a rabbit – mainly to add a touch of charm to their Easter celebration. That’s where we come in, of course. I know that breeders vary widely on their opinions about how to handle the Easter season (that would be the secular Easter season, of course). I personally support the “Make Mine Chocolate” campaign which encourages people to use chocolate rabbits to add the charm to their Easter celebrations rather than real rabbits. But what does supporting the “Make Mine Chocolate” campaign mean in real life to me? First, I don’t breed especially heavy for Easter. That wasn’t always true. My very first two litters were timed to have eight-week old babies ready for Easter sales. Now I wish I could go back and undo that decision. My thought at the time was only that I didn’t want to produce an animal that there was no market for and I knew there would be a market at Easter. I was lucky the first time around, I think. I saw one family months later at a restaurant and they were still in love with their rabbit. But another rabbit came back to me about a year later. Thankfully, I had made the policy early on that I would take my own rabbits back if a family determined that owning a rabbit was not for them. I would hate to think of any rabbit being neglected or released into the wild, but I would especially hate it if it were one of “my” rabbits. I also talked with my feed store a few weeks ago to determine the owner’s practice on selling rabbits at Easter. He was undecided, so I took the opportunity to point out some of the pitfalls in Easter bunny sales. He decided to just skip it. Now I should say that I will sell pet rabbits at Easter. I don’t have blackout dates or anything like that. I screen pet rabbit customers really well these days – I’m looking for committed families with realistic expectations – but I do a more thorough job at Easter. I’m not interested in selling a rabbit as a surprise Easter gift, for example. I talk more about the life expectancy of the rabbit and I try to find out how long the family has been planning to get a rabbit. Families should be made aware that the rabbit could still be alive after their teen goes to college or into the teen years, if the purchase is made for a younger child. Folks buying on an impulse to make Easter more exciting may not be thinking enough about the personality match between the rabbit and the new owner, the responsibilities of feeding, cleaning, and altering the bunny, or whether rabbit ownership even fits into their lifestyle. Needless to say, I don’t sell any rabbits in high-impulse areas: flea markets, to pet stores, to feed stores, etc. And I rarely take pets to shows unless I am meeting someone in particular, so I am not likely to be part of an impulse sale at a show anymore. I think that some breeders feel that it is simply their job to produce the best rabbits they can, but that their responsibility ends when someone else agrees to take over that responsibility. And that’s a reasonable position to take. Pet owners do have responsibility for taking care of pets they choose to adopt. But I feel that it is my responsibility to help that new owner make an informed decision to adopt. I do have a vested interest in the pet adoption working out well. And if a rabbit is suffering from neglect or abuse, it will not matter to him or her one bit whose fault it is. Next Article: What to do with a bunny that was sold too young.